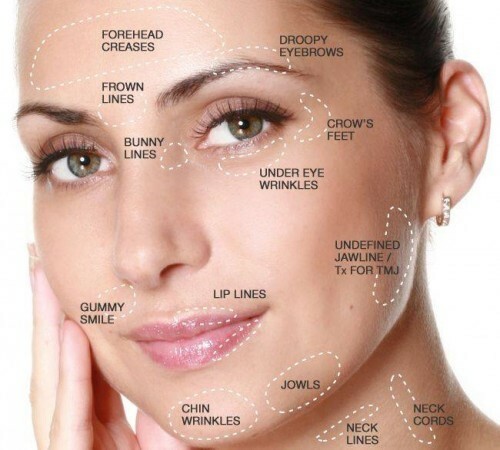 Botox® is one of the most popular cosmetic procedures in the country. It helps relax specific muscle groups in the forehead, between the eyes, around the eyes, forehead, lower face and lips to help you look refreshed, rejuvenated and natural. In addition to smoothing out fine lines and wrinkles, Botox® is useful for treating migraine headaches, TMJ pain (jaw pain) and gummy smiles. We can also inject directly into the masseter muscle to help with harsh jawlines. It works beautifully to give a V-shaped jawline. Over time, permanent furrows and deep wrinkles develop in the skin as a result of aging, overuse and constant muscle contractions. These lines can make you look older, sad, angry or tired, most often developing around the eyes and mouth, as well as between the eyebrows and on the forehead. Fortunately, dermal fillers such as Restylane®, Juvéderm® and Perlane® can erase these signs of aging to restore a younger and more refreshed appearance. Patients can achieve a fuller, younger appearance while still maintaining the natural features that define who they are. Fillers is the most effective in reducing the appearance of nasolabial folds; the lines that run from the bottom of the nose to the corner of the mouth on both sides of the face. A: Botox® is a protein used to relax muscles that cause frown lines, forehead lines and crow’s feet. Botox® takes 7-10 days to see results and lasts 3 to 4 months. How long dermal fillers last? A: Dermal fillers can last up to 18 months. Everyone is a little difference and there are a lot of factors that go into how long a filler can last. We offer free consults at Seven Star Dental, at your appointment we can discuss a good timeline of how long your dermal filler will last. When will I notice a difference once I get a filler? A: When doing dermal fillers you will get your results instantaneously! Are you planning a special event and looking to “wow” a small group of friends and family? With our esthetics services, we will create a memorable experience for you and your loved ones. Our unique VIP service is available to your group at our modern state-of-the-art dental practice. Don’t take our word for it; check us out on YELP, GOOGLE and FACEBOOK!